Saffron Valley is a new Indian restaurant in South Jordan that is owned and run by Lavanya Mahate. Lavanya has been operating an online store called East India Pantry, which specializes in Indian spices, teas, and rice. She decided to expand her culinary offerings by starting her own “Indian street food” restaurant, named Saffron Valley. We were greeted warmly by Lavanya upon our arrival. She is friendly, engaging, and loves to tell you all about their food. The actual layout of the restaurant is a bit quirky, and I think that service suffers a bit since guests aren’t quite sure what we are supposed to do. You order at the walk-up counter, and they give you a number. A few of our orders were completely forgotten, and we had to remind them. We had to grab the waiter’s attention a few times to remind them to refill our water and soda. The food at Saffron is based on Indian street food fare. It is presented in a fresh, beautiful manner. We began our meal with samosas. A perfectly dense mixture of peas and potatoes, wrapped in a light pastry pocket. Served alongside was a delicious tamarind sauce. 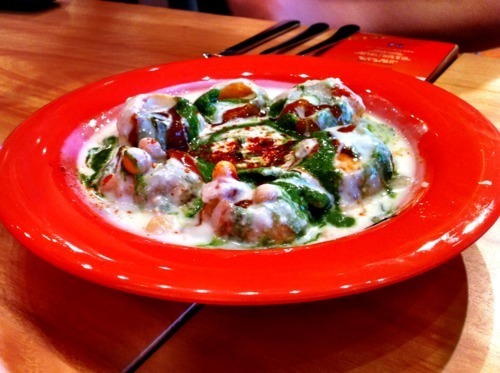 We also tried the Dahi Puri, which is pastry puffs that are topped with potatoes, chickpeas, and doused in a beautiful yogurt and cilantro sauce. For the entreé, I went with the Paneer Dosa, which (I was surprised to find out) is a giant crépe that hangs over the sides of the plate, and filled with a really tasty cheese, peas, and cilantro. I loved the crispy texture of the crépe, but wish that the filling would have been a bit more moist. But the perfectly-spiced lentil dipping sauce and chutney helped make up for this. I had a deliciously smooth, rich strawberry lasso to help cool my mouth between bites. Which reminds me: you can order any dish according to your desired spice level. If you are a baby, like me, stick with the mild or medium (if you want some extra kick). If you enjoy burning your tongue off (or aren’t a complete baby like me), go with the hot. Some guests next to us ordered some hot dishes that were so spicy my eyes practically started watering just by looking at the dishes. On this Saturday night, the place was absolutely packed. The mixed demographics of customers dining tells me that this place is legit. Despite the horde of people dining, the kitchen was able to produce the dishes efficiently. Due to the quirky pseudo self-serve nature of this restaurant, prices are kept lower than what you would find at a normal Indian restaurant. The dishes from the “street food” section are about $5, and are appetizer-size. Main courses range anywhere from $6 up to $11 for the curries and biryani. Saffron also serves a lunch buffet Monday through Saturday. I can’t wait to come back and try more of the menu! 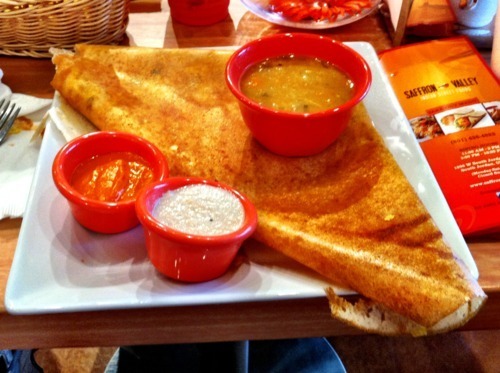 Affordable Indian food at the South end of the valley! Yay!